A knight is positioned on the centre square of this chessboard. 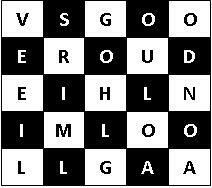 Move the knight to each square once only, collecting letters to spell out five types of dwelling. Each dwelling is five letters long. Well done to Finlay in 9AH and Thomas in 8AH who both got the correct answer to our weekly Brainteaser. They will be receiving a Praise Postcard and Hall points for their efforts. Business Enterprise meeting for Year 7 Scholars with Mrs Allen in A214 on Wednesday 13th January 2016 at 12.30pm. Don’t forget to pre-order your lunch so you can pick it up. On Thursday 21st January 2016, we have our Year 9 Choices Evening. Through the Choices Evening on Thursday 21st January 2016, we hope that you will be able to enhance the information that you already have, to enable you and your child to make well informed decisions relating to Key Stage 4 option choices for Year 10 and 11, choices that will form the basis of further study/training at Key Stage 5. 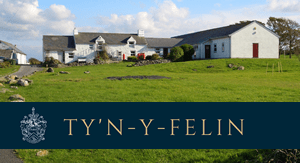 If at any point in the evening, you would like to speak to a senior member of staff, they will be on hand to assist you. Reminder from Mrs Allen that there is a further business enterprise meeting today in A214 at 1pm. 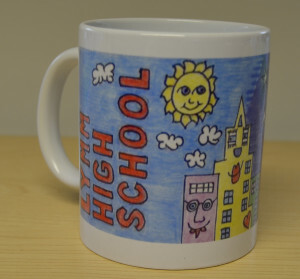 Recently, a competition was held by the Art Department, for Key Stage 3 students to design a Lymm High School Mug. The winning design has now been selected and used to create our Lymm High School mugs, which are now available in the school shop. The mugs cost £5 each and all profits go to the PTA sponsored projects. Congratulations to Erin O’Connor in Year 9 on her winning design! We have a Girls Boxing Club beginning next week on Thursday 14th January. The club will take place in the small gym every Thursday for 10 weeks from 3:15-4:15pm. The club will be ran by two Level 2 Qualified Boxing Coaches, Darren Harrison and Jonathon Scott. The first Session on Thursday 14th January will be a free taster session with the remaining sessions costing £2 each. Happy New Year! I do hope you’ve had an enjoyable festive period and I wish you all the very best for a happy and successful 2016. We are certainly looking forward to building on the positive steps made last term. I spoke to all staff yesterday and reiterated that the key challenge for this year is to raise our expectations of what we expect of all students. We feel as if we are making significant progress in some key areas, such as the setting of more homework, the marking of books and the reduction of low-level disruption in lessons, but we know that there is still plenty of work to be done. Thank you for your continued support. It is with great pleasure that we offer our congratulations to Len Davies – governor, trustee & recently retired teacher at Lymm High School – who has been awarded the British Empire Medal in the New Year’s Honours List for his services to Rugby Union at levels including school, county, regional and national level. We are all absolutely delighted to see Len’s dedication, hard work and commitment to the school and to Rugby Union recognised by the award of an honour. 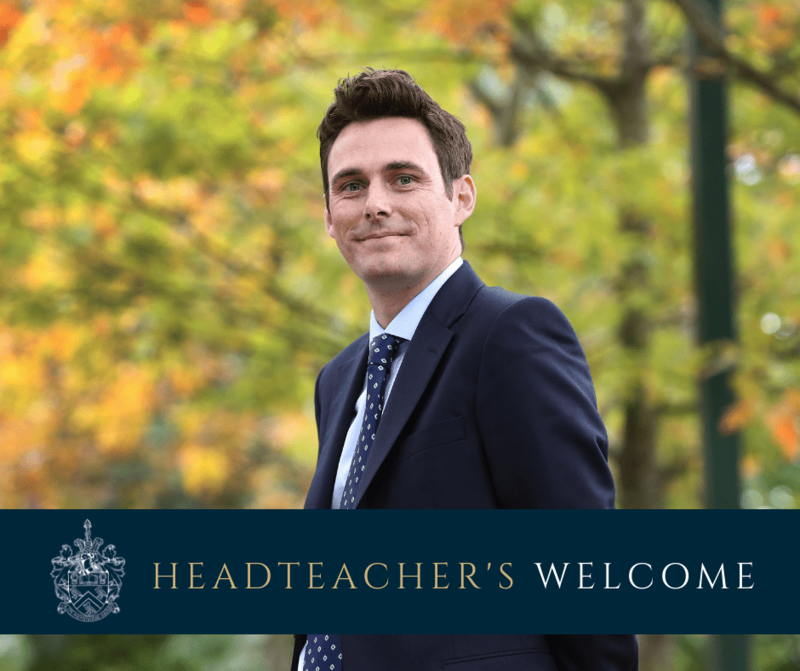 Through his own sporting career, his service as a teacher and his love of sport, he has been a great role model both for colleagues and for pupils. We are really pleased that while he is enjoying a well-deserved retirement he continues to be involved in the school as a community governor. On Thursday 7th January, we have our Year 9 Parents Evening, between 5.00pm-8.00pm. The evening will be an opportunity to gather detailed feedback regarding how your child is currently progressing. This will support them in making informed decisions during the choices process for Key Stage 4. There will also be an Information and Guidance Evening on Thursday 21st January. More information about the IAG Evening will be available soon. Along with all schools in Cheshire, Lymm High School is part of a new Cheshire Police initiative called Operation Encompass. This scheme is designed to ensure that children and young people are better supported following their exposure to domestic incidents outside of school. Please see the link here or contact Mrs R Ball (Designated Safeguarding Lead) if you would like any further information. Finally, the next PTA meeting will take place on Monday 11th January at 7pm in the Music Room, Leisure Centre. All parents are welcome to attend. Are you up for the Reading Challenge 2016? Take a look at the mission attached – should you choose to accept it – and see how far you can get through the list. If you’re looking for some inspiration why not click on the link to see what 100 fiction books all students should read before leaving secondary school. How many have you read? Please can Year 10 and 11 students on the Scholars Programme go to the Board Room, Wednesday 6th January at 12.45pm for a talk from a former student who is studying at Cambridge University, to find out the reality of being a student at an Oxbridge University. Emma is currently studying chemical engineering and completed a year studying Natural Sciences and is happy to take additional questions from students interested in these fields.